Officers arrested almost a dozen people in San Francisco in separate cases over five days early this month as the department continues to battle the epidemic of auto burglaries in The City. Auto theft has long been a problem in San Francisco, and such crimes have increased over the last few years. In September 2017, police reported that these burglaries were up by 28 percent citywide year-over-year for the seven-month period from January to July. Police said today they are combating auto burglaries through the strategic deployment of resources, increased responsiveness and expanded deployment of both patrol and undercover officers. On April 2 around 1:45 a.m., officers were dispatched to the area of Grant and Filbert streets on a report of people breaking into vehicles, police said. The suspects had fled, but officers tracked down four people who were allegedly involved in the burglary and took them into custody, police said. Tyler McKinney, 26, of Berkeley; Christopher Wise, 28, of Sacramento; Robert Warren, 23, of San Francisco; and a 16-year-old boy were booked on suspicion of burglary and conspiracy, according to police. In the second case, officers were patrolling the area of Church and 20th streets April 3 around 11 p.m. when they saw a car with paper plates. When they tried to stop the car, it sped off, colliding with another car at 25th and Church streets, according to police. Officers found the alleged driver, Dominic Spears, 18, a transient, and arrested him and booked him at the San Francisco County Jail on suspicion of vehicle theft, one count of possession of stolen property and related offenses, police said. In the third case, Troy Savoy, 20, of San Francisco, was arrested and booked at San Francisco County Jail April 4 on suspicion of second-degree burglary and related offenses. Earl Jihad, 18, of Pleasant Hill, was booked on suspicion of second-degree burglary and related offenses, police said. 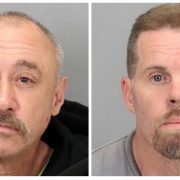 In the fourth case, Manuel Mills, 30, of Richmond, Taj Williams, 41, of Alameda, Savannah Jacobs, 25, of Richmond, were arrested and booked on suspicion of burglary and other offenses, police said. In the fifth case, Troy Hawthorne, 34, a transient, was arrested and booked on suspicion of burglary and other offenses, according to police.